I did google around trying to find a solution. I did find a couple of people with the same problem, but no solution posted. I googled for the service manual with no result other than someone in the states selling on ebay for around $22. I wish companies like this would get their service manuals PDF’d and onto the web – shouldn’t be an issue for what is essentially obsolete equipment? 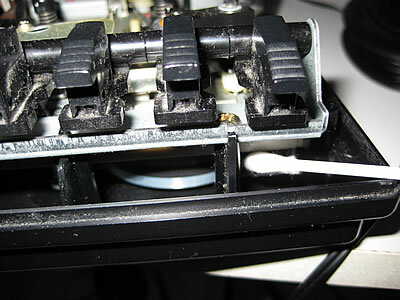 all the other sliders remain with the top of the case – but some detach in the process from the underlying control which remains in the base. 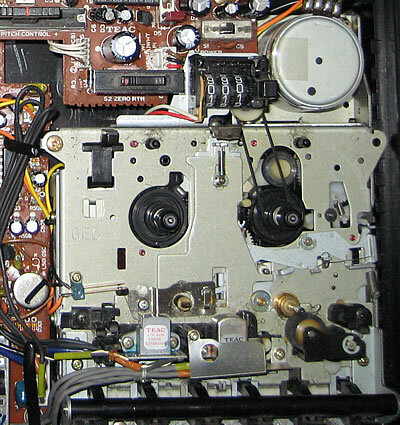 In my case the forward position of the tape heads was preventing the sides from separating. Pressing them back by pressing the plastic between the erase and write heads made enough space. With the sides parted, I then powered up and observed the mechanics when pressing the various control buttons. I couldn’t see anything obvious, but then noticed that underneath the controls is a flywheel attached to that capstan in-front of the stop button. The flywheel is belt-driven and was not spinning. Using a cotton bud, I gave it a few nudges, attempting to pushing it round in either direction. I was quite surprised after a few attempts when the belt picked up and the flywheel turned under the power of the motor. 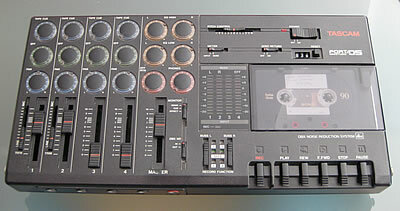 At the same time the heads snapped back into the retracted position, and the play and record buttons now worked. All that remained was to give it a good clean-out and reassemble. 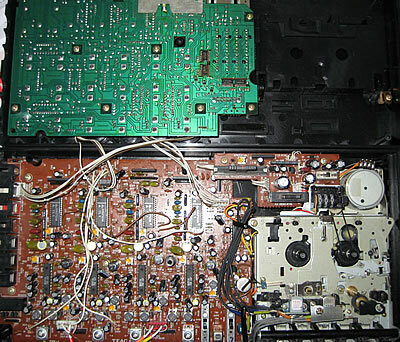 Taking care to align the Record function sliders with their underlying controls, and get the 5 screws back in, and I am back in action with kit that I thought was pretty cutting edge back in 1987.